We stock a range of sizes of ball jointed adjustable levelling feet with the handling of many weight ratings. These adjustable levelling feet are ideal for heavy industrial, light industrial, commercial or workshops. 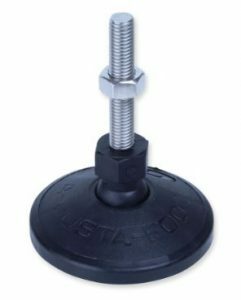 The A-Justa-Foot ball jointed adjustable levelling foot can solve problems with uneven or sloping floors and can be applied to furniture, cabinetry, machinery, benches and shelving. For machinery, there is a special pad in the base which helps to absorb vibration and movement. There are many uses for the ball jointed adjustable foot, and we often supply to carpenters or other tradespeople who can be on an on-site job who require wood saws for example, to sit on uneven concrete, pathways or household paving. The adjustable angling is perfect for positioning and levelling machines to sit steadily on a sloped surface. Kitchen or cabinet manufacturers may have uneven workshop flooring and they rely on adjustable levelling feet for various tools and machinery, and the ability to angle. Within our A-Justa-Foot range, we can also supply bolt down and fixed adjustable levelling feet in a range of sizes. 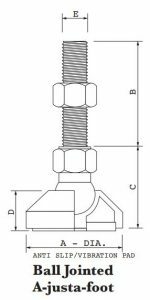 The Ball Jointed A-Justa-Foot (Levelling foot) is available in Zinc Plated Mild Steel Thread (20 Series) OR 304 Stainless Steel Thread (21 Series). Ball Jointed A-Justa-Foot is available in other stud lengths (B) as required, if ordered in quantity. Contact us to obtain a quote.